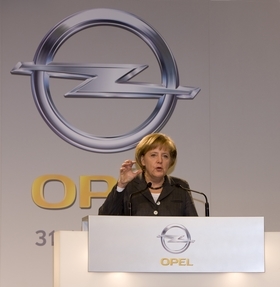 Merkel's German government wants Magna to win the bidding for Opel. BERLIN(Reuters) -- German Chancellor Angela Merkel expressed doubt that financial investor RHJ International SA would succeed in its bid for General Motors Co. subsidiary Opel. Her comments came on the eve of a Friday meeting during which GM's board is expected to announce its preference. Merkel told the Frankfurter Allgemeine Zeitung she was "very skeptical" about the prospects for RHJ and reiterated her preference for a rival offer from Canadian-Austrian supplier Magna International Inc. The two want to buy GM's European auto operations. GM, which holds a stake in Opel and its U.K.-based sister brand Vauxhall, and the German government, which has promised to provide billions in aid, must agree on the buyer. GM's board of directors will address the sale of Opel on Friday and aims to recommend one of the suitors, sources close to the deal have told Reuters. German Economy Minister Karl-Theodor zu Guttenberg said he expected GM to send a signal about its preference on Friday. He said he won assurances from other European states that have Opel plants that they would contribute to aid for Opel. Britain said it expected the board to make an objective decision that will "secure the long-term viability of both Opel and Vauxhall in the U.K."
Concerned about 5,000 Vauxhall jobs in the U.K. in the year ahead of a general election, Business Secretary Peter Mandelson said the decision "should not be distorted by political considerations in any one country." "The U.K. Government has asked the GM board to take full account of the relevant interests in all European countries as this will shape the public funding decisions by all the member states and state aid approval by the European Commission," he said in a statement. German leaders want to protect the country's 25,000 Opel jobs ahead of next month's election. To push GM toward choosing Magna the government has firmed up an offer to make 4.5 billion euros ($6.40 billion) in state aid available should GM select the supplier, which is Berlin's preferred partner. Germany made the offer to facilitate a solution to the bidding, but would continue to work with other countries in which Opel has plants to come up with a joint solution, government spokesman Ulrich Wilhelm told Reuters on Thursday. Trustees who oversee a majority stake in Opel -- which was propped up with 1.5 billion euros in German aid in May to avoid being swept into GM's brief bankruptcy -- must approve any decision. Germany has championed the Magna bid, which also includes state-controlled Russian lender Sberbank, and aims to expand Opel's reach while some GM executives praised RHJ's offer, which envisages shrinking Opel to make it profitable.